The civil war and UN response to the ongoing Libya crisis, with Gaddafi refusing to leave, continually threatening his own people and anyone who helps them. US, French and other nations created a “no-fly” zone and now are using attack helicopters on remaining Gaddafi strongholds. Many of his inner circle have now defected so surely he can’t hold out too much longer. Floods, tornadoes, massive destruction in the heartland of the United States! America needs God’s mercy. The massive 9.0 earthquake in Japan, which was followed by a devastating tsunami, which was followed by damage and radiation leaks from a major nuclear power plant locations with multiple reactors, topped by winter storms, lack of power for heat, and lack of transportation because of destroyed roads and power-less trains. This is a disaster of unprecedented proportions and the world is responding, but it is ongoing with the news up and down — mainly from the unknown conditions inside the broken reactors. There are ongoing protests in Yemen and now Syria, with Bahrain having just more-or-less put down one by force in their own kingdom. Their government claims that a foreign power had instigated those protests (did not name Iran but obviously meant them). I read Sky News, Voice of America, BBC World, Jerusalem Post, Fars News, Al Jazeera and many other online news sources daily, when I can. Hope I can get back to culling articles that seem most relevant to end times very soon. 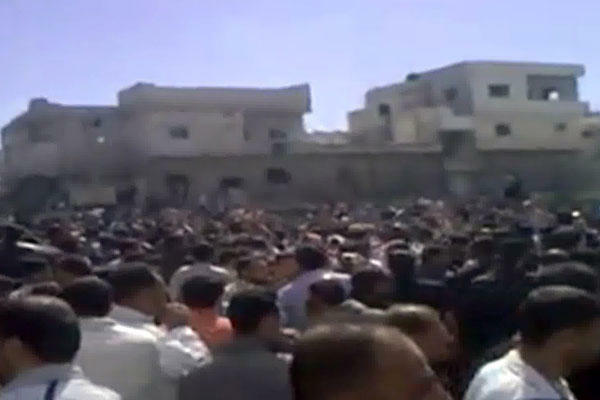 Troops in Gulf state fired in the air on the fourth day of rallies demanding jobs and political reform. The unrest in Sohar has been a rare outbreak of discontent in the normally sleepy sultanate of Oman. Oman is a non-OPEC oil exporter which pumps around 850,000 bpd, and has strong military and political ties to the West. Fresh protests have taken place in the Gulf sultanate of Oman, following a wave of pro-democracy demonstrations across the Arab world. Witnesses said troops fired in the air, wounding one person, on Tuesday as they attempted to disperse a crowd of protesters near the northern port of Sohar. The crowd dispersed only to regroup at the nearby Globe Roundabout, located close to the port, and the troops pulled back, the witnesses said. Later, however, traffic started to flow freely into the port, and at the roundabout five armoured vehicles watched the square but no protesters could be seen. The Globe Roundabout has drawn up to 2,000 demonstrators over the past three days. It was the fourth day of protests in Oman, with the crowd continuing to demand jobs and political reforms . 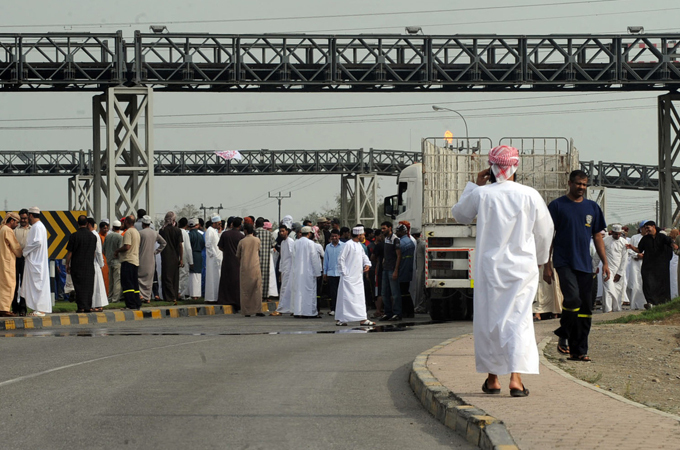 Demonstrators on Monday blocked the entrance to Sohar port, which exports 160,000 barrels per day of refined oil products, and protests spread to the capital, Muscat. The unrest in Sohar, Oman’s main industrial centre, was a rare outbreak of discontent in the normally sleepy sultanate which has been ruled by Sultan Qaboos bin Said for four decades. On Sunday, in a bid to calm tensions, the sultan promised 50,000 jobs, unemployment benefits of $390 a month and to consider widening the power of a quasi-parliamentary advisory council. As many as six people were killed in Sohar, on Sunday, when police opened fire on stone-throwing demonstrators after failing to disperse them with batons and tear gas. A doctor and several nurses at a state hospital said six people died but the health minister put the toll at one. Political parties are banned in Oman and Sultan Qaboos exercises absolute power in the country. He shuffled his cabinet on Saturday, a week after a small protest in the capital Muscat, gave the first indication that Arab discontent could reach Oman. Mostly wealthy Gulf Arab countries, including Kuwait and Saudi Arabia, have pledged billions of dollars in state benefits and offered modest reforms to appease their populations. The move has come following popular unrest that toppled the leaders of Tunisia and Egypt and is threatening Muammar Gaddafi’s grip on Libya.